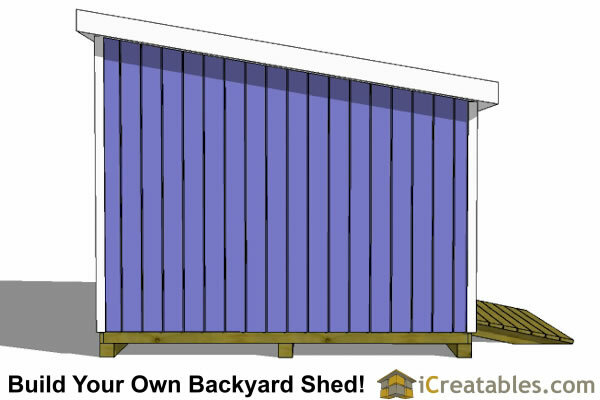 7'-7" wall height - The lower wall height is 7'-7" which allows a pre-hung factory built door to go on any wall and reduces the amount of siding and labor needed to build the shed. Factory or Home Built Doors - Using a pre hung door makes the door building and hanging job much easier. 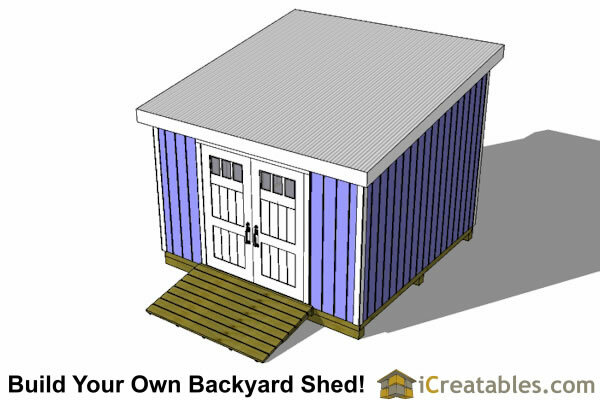 The shed plans also include door plans if you prefer to build your own doors. 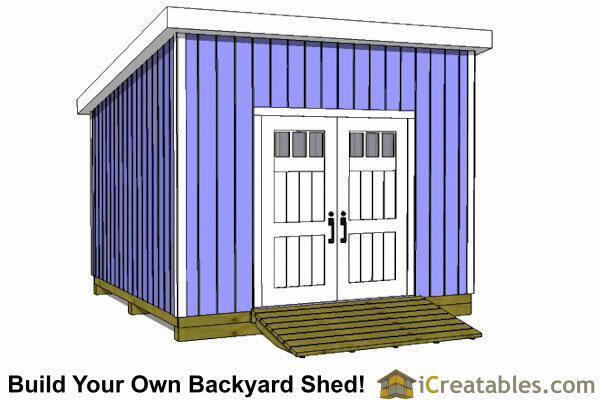 Multiple Door Options - Drawings explaining how to build the door on the end or sides of the shed. 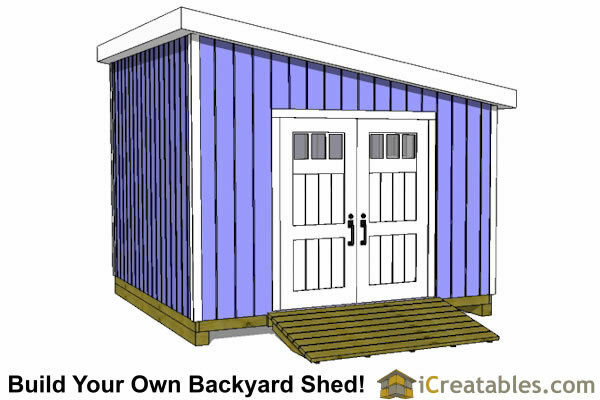 Example of our 12x12 lean to shed plans. 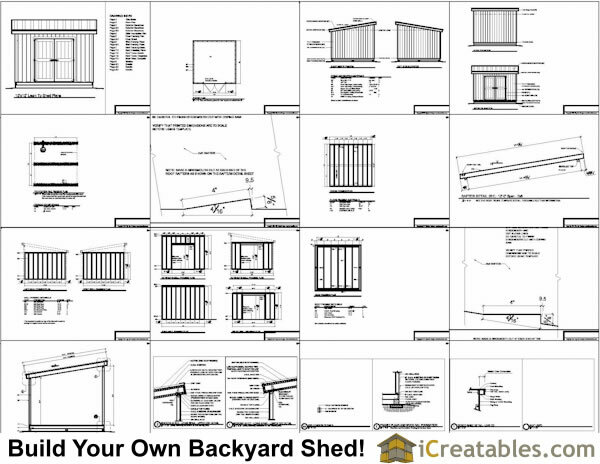 Materials List:The 12x12 Lean To shed plans come with a complete materials list that is broken down by parts of the shed. 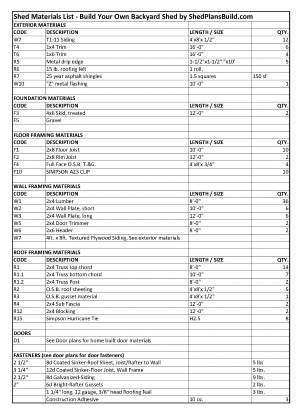 Foundations: There are 5 different foundations are included in the plans; Wood skid, Concrete slab, Concrete Block Pier, Poured Concrete Pier and Precast pier. Floor: 2x6 floor joists at 16" on center with 3/4" floor sheathing. 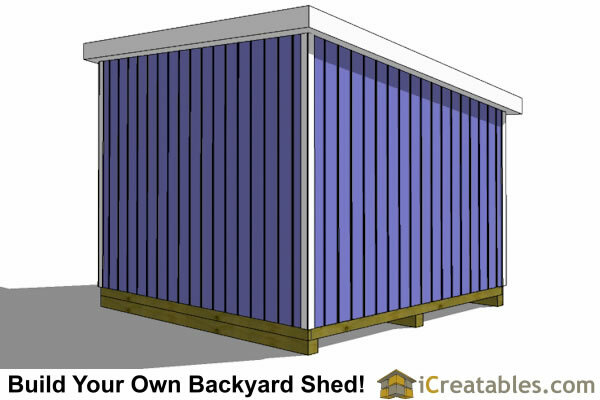 Wall Height: The lower shed wall height is 7'-5", the higher wall is just over 10'-0". Doors: The doors are a pair of 3068 pre-hung, factory made doors for ease of installation. 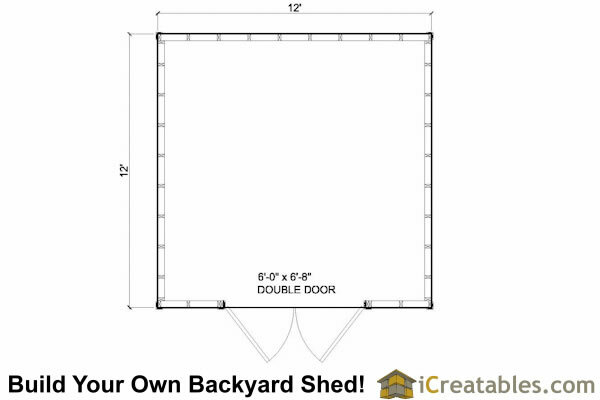 A single door may be installed if desired. 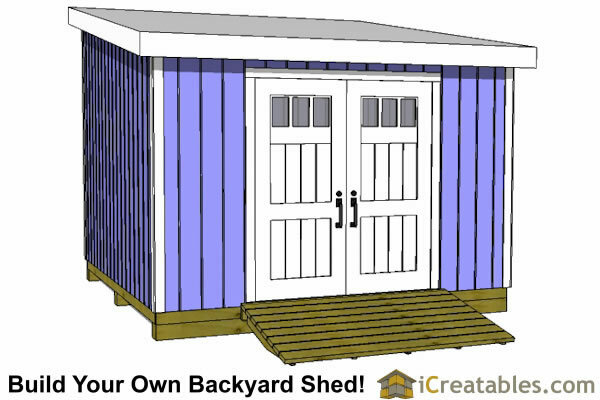 The shed plans include plans detailing how to build home built doors that fit in the 6068 door opening. Window: There are no windows on the plans but windows can be added on any wall. Siding: Textured Plywood siding is what is shown on the plans. You may add or substitute other sidings such as cedar shingles or horizontal lap siding or vinyl siding. Roof:The roof is framed using 2x8's to build the rafters. It is sheeted with 1/2" O.S.B. The plans give you a template and dimensions for the birds mouth cut angles. Check with your local building department to see if you can use smaller rafter sizes in your area. Roof Pitch: 2/12, this means that for every 2 inches of rise there is 12 inches of run horizontally. Roof Overhang: 6" on the front and back. 1" on the sides. Roofing = PBR Corrugated metal roofing shape designed for low slope roofs. Trim = 1x4 and 1x6 wood, masonite or cement trim materials are used to finish the corners, roof eves, facia, and door. Floor Load: 50 pounds per square foot for framed floors.